I got a request a while ago to build this model. 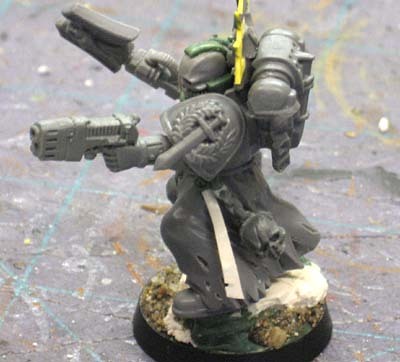 Of course I said yes, it's a Dark Angels model and a Chaplain on top of that. I built this guy to match the picture in the Dark Angels Codex. While he may not be an exact match, I think I was definitely able to capture the feel of the model. Now I've got to say, Richie over at Wargamers World was incredibly helpful in getting me the bits I need for this particular project. I do lots of bits hunting for each of my projects because I generally need one of "these" or just one of "those" and it's always the bit everyone seems to want or is never in stock. Richie came through for me and got me what I needed so that I could build this guy and not spend any more money than necessary. For those of you back across the pond (in the UK), he's worth checking out. I've found that if you don't see the particular bit you want, just email him, he generally has it in stock. The only problem I have over here in the States is shipping can be delayed sometimes with customs. And here he is, my version of the picture. When I start model like this, I usually have a good idea how I'm going to build most of the model. Like I mentioned, I try and get the exact bits I need to minimize cost and conversion work for a client. One, it makes it easier for me and two, it can save in time and money. More often than not though, there's always one part that I have no idea how I'm going to build since there is no bit for it. In this case, it was his Iron Halo. It's made with a standard marine banner topper that has had the bottom trimmed off and it rests on his back collar piece. Around it is a plasticard halo with greenstuff added for the texture. I figured I could do it when I took on the project, but like I said, I wasn't sure until I sat down and started cutting and fitting the pieces together. 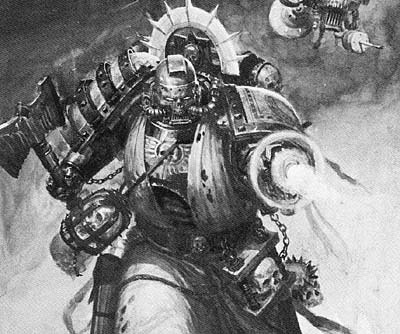 The skull helmet was done the same way as before on another model so that was no big deal. I did however have to extend his collar to make it look correct. In the end, extending the collar helped bulk out the model a bit and helped overall too. 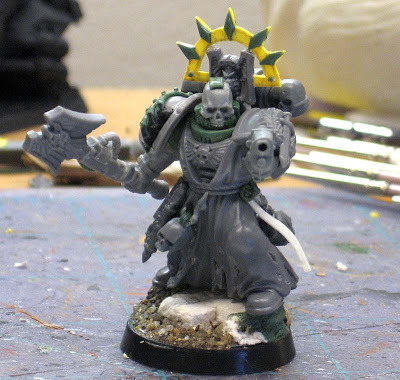 I ended up adding one purity seal to the model and made it myself from cardstock and greenstuff. I wanted a certain shape and length to fit in with the rest of the model. Other than that, I tried to keep with the skull theme and added those instead. 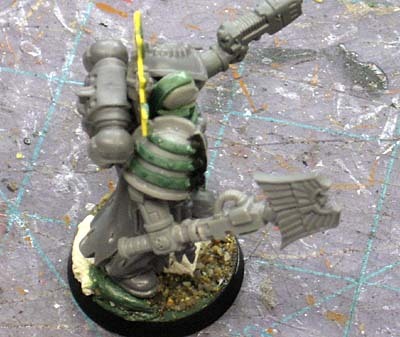 The crozius is a simple assault squad power axe with the blade cut off and a Dark Angels icon substituted in place of it. I also shortened it a bit so it looked better for scale purposes. His left shoulderpad was sculpted to match the picture. The black paint you see on his shoulderpad there is where I painted the rivets and the surrounding area to see how they would look as one color. Sometimes the superglue dries white and I want to make sure the area is "correct" in terms of shapes and the way everything fits together. Adding a thinned out layer of paint allows me to look at the model without being distracted by the parts. Kind of like how priming your models make them look so much better and you see problems you missed before... same thing. And as an added bonus, my friend decided to do a bit of a review on the model and take a closer look at it all around. He also sent me a pic of the finished model. Thanks for the kind words! Ron, could you give more detail on the helmet? Awesome job! That's going to look great when it is finished. Really great Ron. Can you please give list of the bits you used on the Chappy especially the Backpack ad the Helmet. Yeah, yeah, yeah... this looks great, I love the skull helmet and everything. But were is "Powders: Part 2"???? Great conversion! and I'm not just saying that because I'm a huge DA fan. 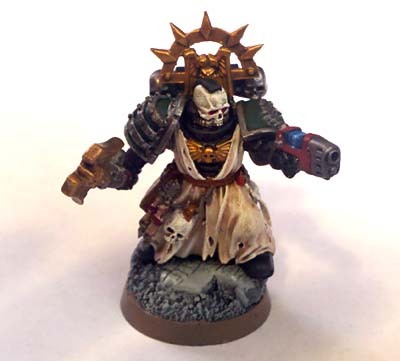 Excellent conversion, Your attention to detail is amazing! I'd like to see more on the skull helmet as well. Thanks for the feedback guys, I apprecciate it. I only mentioned the skull helmet before... for those who asked, I will do a step by step for it. It's fairly simple, but requires a couple things to pull it off correctly.